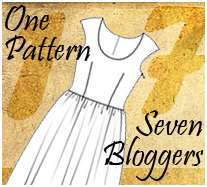 Week one of One Pattern Seven Bloggers has surprisingly already been and gone, which is scary considering there is now only three weeks to go until our big reveal...eeek! Firstly I cut out and sewed up my size, just to see what was what. As you can see, it was a few inches too small! I think this could be because I didn't realise I had to add a seam allowance to the pattern...oops! Instead of cutting a brand new muslin, I decided to see if letting out some of the ample darts could fix my predicament. Such a simple adjustment seemed to work pretty well. However, as you can see the back neckline gaped a little and the waistline sat too low down for my body shape...basically it sat too close to my muffin tops. To fix this, I put a couple of small darts at the back neckline and trimmed about two inches off the bottom of the bodice. Although I managed to fix the back neckline gape, I ended up with a baggy waistline. So I went back to the drawing board and decided to take the front darts in again, after letting them out in the first place. This was successful, but it made me realise that had I gotten the length right in the first place, I probably wouldn't have had to fiddle about with the darts. Oh well, a good lesson learned! It looks like all the tweaking I did was suddenly erased! Everything's too big, apart from the back bodice which looks a little tight. Even the front neckline doesn't sit as well as before and the sagging on the back neckline has re-appeared! I'm stumped and would love it if anyone could shed any light on how I can fix all this. Any help would be much appreciated! So, in short, I have a lot more work to do and not much time to do it in, if this little number is to become wearable in any way. Fingers crossed it will! The length of the back bodice piece looks a little long, shortening it should remove the bunching at the back. My only real suggestion for the front is to put it on inside out and re-pin the dart to take it in under the bust. On the bright side, I love how the pleated skirt looks! Oh man, tell me about it! When I did the fitting for this dress it took three (repeat three) muslins! Hang in there and remember: a seam ripper is a girl's best friend. Oh boy this is why i hate sewing sometimes, fitting is so stressful! Sorry I can't be of any help. Hope you get it sorted. Fitting is so difficult but you're doing a great job! I agree that the back bodice is too long. I'd suggest shortening the bottom edge and maybe take out a wedge from the mid back, where the fabric is wrinkling horizontally. On the front bodice the darts seem too tall. The darts should end 2.5cm+ from the bust apex. Curved darts should work very well here. You can also pinch out the excess fabric at the armscye if that bothers you, and cut the fabric with that pinch in the pattern. As long as doing so doesn't reduce your range of motion too much!